Heat oven to 425°F. In large bowl, mix filling ingredients. Pour into pie crust. Bake 15 minutes. Reduce oven temperature to 350°F; bake 40 to 50 minutes longer or until knife inserted near center comes out clean. Cool 2 hours. Serve or refrigerate until serving time. Store in refrigerator. Read the canned pumpkin label carefully to make sure you’re not buying canned pumpkin pie mix, which already contains seasonings. Unlike other pies, a pumpkin pie can be made entirely from pantry items. Stock up on pure canned pumpkin and evaporated milk when they’re on sale so you can make a pumpkin pie without having to make a trip to the store. Pumpkin pie spice is a balanced blend of warm (a reference to seasonings that make us feel warmer—and sometimes cozier) spices that come from dried barks, roots, seeds, or chiles. Cinnamon, ginger, cloves, and nutmeg are important players, though every commercial blend may vary in the ratio of ingredients. Try it with sautéed apples, sprinkled over a pan of roasted root vegetables, or rubbed over a pork roast before cooking. Why not make two pies, one for tonight and one for the freezer. Since a pre-made pie crust is in an aluminum pan, a baked pie will freeze faster—preventing large ice crystals from forming. Cool the pie completely on a wire rack, then wrap it well in plastic wrap, then in a final sheet of foil. Label it with the date, then pop it into the freezer for up to 1 month. Allow it to thaw in the refrigerator (it will need about 12 hours) before slicing it up for serving. Refrigerate any leftover pie because the filling is an egg-based custard, which should be chilled for longer storage. Leftover pumpkin pie can be stored in the fridge for up to four days. Serve each slice with a dollop of whipped cream! Want to make your own? Simply beat together a 1/2 cup of whipping cream, 1 tablespoon of sugar and 1/4 teaspoon of pumpkin pie spice on high speed until soft peaks form. The name of this recipe says it all: this really is an easy pumpkin pie recipe. Pillsbury™ Pet-Ritz® frozen deep-dish pie crust eliminates the need to fuss with a crust, and the super-easy pumpkin filling can be prepped all in one bowl and poured into the crust in just a few minutes. 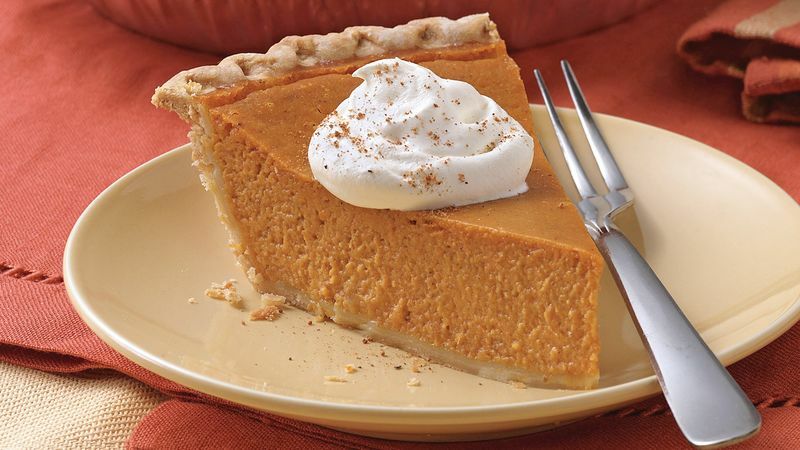 Want to learn more about the art and science of easy pumpkin pie making? Our pumpkin pie guide has the answers. And we have plenty more pumpkin pie recipes to tempt your taste buds—from those with streusel toppings to slab pie versions that are great for crowds.